There are people who think that there is a possibility of rebirth, but no one can be sure about a second life! 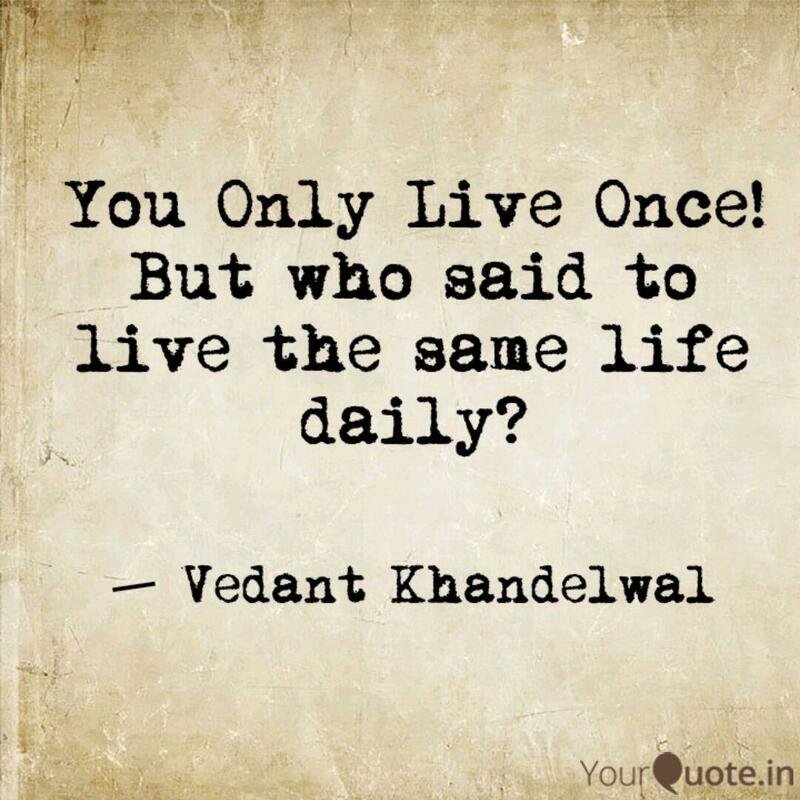 This is why you might have heard many times… “We live only once” or the famous acronym #YOLO – You Only Live Once! Why is it so that you have to only live ONCE? Almost everyone gets the chance to be a child, sibling, friend, partner, parent… but what else you can do so that you can live a life with many more mini-lives inside this single package!! In my book Single Rule For Success, you will find a line where it is written to that you should do something, which will keep you alive even after you are gone physically from this world! This line might seem simple, but there is a deep meaning hidden in this. You should not work hard so that people may remember you after you are gone, but you should work in such a way that you have lived your life fully as per your own will, and there is nothing left pending in your mind when you are taking your last breath. Why only become sportsperson? Why not be a great singer too? Why just become a great painter? Why not be a chess player too? I know we have only one life, but why should we live it only once? Don’t be king of a single trade, be the jack of all! Don’t leave anything which you want to try out but something is stopping you from trying it! You are the boss of your own life, live it multiple times, learn, explore, live! I have been an Engineer – I didn’t just complete my Btech, but I also built a robot with my friends and we won the competition too! Me and my three friends – Pallavi, Quayad, and Shubhi tried a lot but the circuit was burning all the time. All our resources were almost finished but what was still left, was our excitement and craze to build the robot. We finished it without a proper body and temporary wiring and you know what happened! We won! That was a great day for all of us! I have been a Manager – During my MBA, I was the President of Management Student Association. My main work was to solve issues among the classmates and the committees. I learned a lot from this role. I learned how much patience and calmness is necessary to think practically and take the right decision. I learned how to be a good orator, to gain the attention of everyone and make them understand the situation. Apart from these, I’ve played many small roles too, and I know you would have done the same! But, did you ever go back and thought what did you learned from it? How did it help you move ahead in life or was it just a waste of time? Think and give an answer to yourself! I have to live many more roles too so that I can expand my creativity and imagination. I wish all the very best for you! Do, let me know about your own success stories, it keeps me motivated! That’s great that you liked my article and my thoughts. I read your article and it’s really very inspiring and motivating! Thank you for the post and the information. It is very useful for children. We can also enroll our kid in such a good place like Montessori Schools in Velachery for the bright future.